Recently, I wrote about Pol/ Gates in Jaipur – Pol / Gates in Jaipur wherein I posted pictures of Gates and Pols in Jaipur. Many readers evinced a great interest in this architectural element of Jaipur. Some people refer to old city gates as Jaipur Gates which were entry & exit points from Jaipur walled city. Jaipur city wall was an essential part of old Jaipur or walled city planning by Maharajah Sawai Jai Singh II founder of Jaipur. Most travelers will be able to recall popular Gates of Jaipur like Sanganeri gate, Ajmeri gate, Tripolia Gate and so on. Entry gates of the Walled City Jaipur or old city of Jaipur are hard to miss. These gates marked the outer periphery of Jaipur city as laid out by Maharajah Sawai Jai Singh II during the founding of this city in 1727 AD. As per the plan, a 6-meter high and 3-meter thick wall surrounded Jaipur, containing the city within. This wall acted as a security feature, protecting the city & its inhabitants from any outside threats like attacking armies, wild animals, and dacoits etc. Any movement in and out of the city was routed through these gates. Initially, the city was protected by 8 gates in all four directions. These gates would close at dusk and open only after dawn. To alarm all citizens in the evening about the impending closure of gates, a small cannon would be fired in a similar fashion to the sounding of bells. This scheme of closing the gates at dusk was followed till the 1940’s. Thereafter, this practice was discontinued because new areas were being developed outside the walled city and the city extended much beyond these gates. Today, these gates are merely symbolic; part of city’s history, Nostalgia and built heritage. However, they are also an important element of Jaipur’s rich architectural legacy for which city is famous across the world. Moving on to the old city gates of Jaipur. There is a popular opinion that the foundation of Jaipur city started with this gate. Situated on the northern boundary of the city, this gate was initially called Druv gate. Druv stands for Druv Tara or Pole Star -a fixed star in the sky, associated with the north direction. This gate connected to Amer town and Delhi. If you’re driving down to Jaipur from Delhi via Amer town, you’ll pass through this gate. 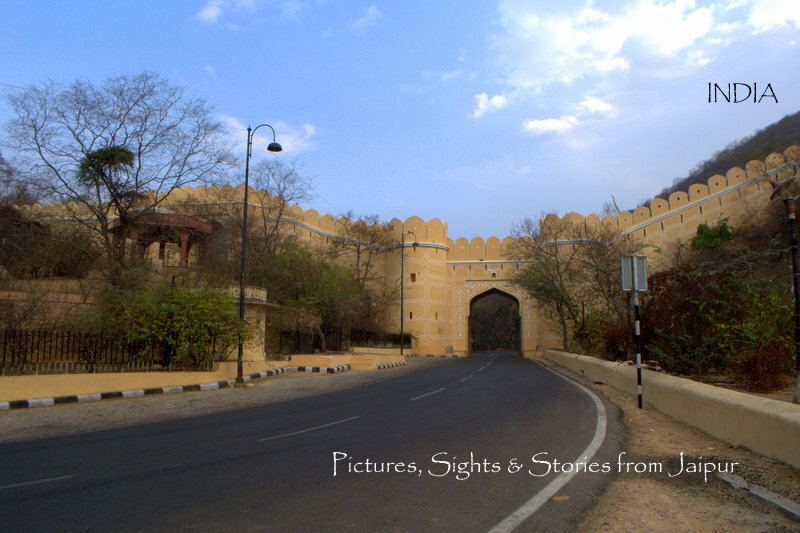 Features – Jorawar Singh Gate is widest among all old city gates in Jaipur. The secondary gates on either side are also quite wide which reminds us of its importance for the city. Surajpole is located on the Eastern periphery of the walled city of Jaipur. Suraj means Sun in English. This gate marks the direction of Sunrise. The famous Sun temple or Surya Mandir is situated close by on the hills. This gate leads to the Galta Gate, which connects to the Galta Temples, also famous by the name of Monkey Temple among the foreign tourists. Location – Delhi Highway near Galata Hills/ Sun Temple. Feature – It has only one secondary gate. Old City Gates of Jaipur – Ghat Gate linking Agra Road with the Ramganj Bazar. Ghat Gate was named so because this gate leads to the Ghat area i.e. Purana Ghat. (Read about the meaning of Ghat here). It was initially called Ram Pol and led to Ramganj area. Of all the gates, this one was located in an area which was least developed in the walled city. Even today, areas surrounding this gate are not considered as a prominent part of the walled city. This gate marks the south direction of the old walled city of Jaipur. Feature – This too has a single secondary gate. Sanganeri Gate is a prominent gate because it leads to the Johari Bazaar, the most famous Bazaar of Jaipur in the walled city area. Johari Bazaar is most frequented by the tourists and locals alike. It’s a buzzing market. This gate is called Sanganeri gate because it opened to the road leading to Sanganer Town which is famous for the Jaipuri prints or Sanganeri prints. Sanganeri Prints refer to fabric famous for organic colors as well as unique motifs created using the block printing technique. This gate also marks the south direction of the old walled city of Jaipur. Feature – Shiv Pol and Kishan Pol are quite similar in terms of design. The design follows a large primary door in the center and secondary doors on either side. Old City Gates of Jaipur – Ajmeri Gate on MI Road which leads you to the Kishanpole Bazaar, Jaipur. Kishanpole is commonly referred as Ajmeri Gate. It was called so because this gate opened up on the road leading to the town of Ajmer. The importance of Ajmer was due to the famous Ajmer Sharif Dargah, a popular Muslim shrine which was frequented by the Mughal ruler Akbar (1567-1605 AD). This gate opens into Kishanpole Bazaar. This gate marks the south direction of the old walled city of Jaipur. Read about the Maharajah School of Arts & Craft in Kishanpole Bazaar in my earlier post. Feature – The design follows a popular architecture of a large size primary door in the center and smaller secondary doors on either side. Chandpole Gate marked the western limit of the walled city of Jaipur. Chand means Moon in Hindi. Since the Moon is associated with the west direction, this gate was called Chandpole or Chand Pol. This gate is located on the same axis as Suraj Pol. Both gates marks either ends of the walled city and they are connected by a major arterial East-West road. Bazaar surrounding this gate is called Chandpole Bazaar. It’s a very active & bustling market. Feature – Huge primary gate with unusually small secondary gates on either side. You will find a very popular temple dedicated to Lord Hanuman just next to this gate. Samraat Gate or Samrat Gate is one of the least known gates of the walled city of Jaipur. It’s in the Brahampuri area close to Jorawar Singh Gate. This gate is situated on the north-west section of the walled city, providing access to Brahampuri area. In some of the old records, it is also referred as Brahma Pol. Gangapole Gate is also located close to Jorawar Singh Gate. Like Samrat Gate, this gate is not a well known. However, it’s much grander than Samrat Gate. A very popular heritage hotel by the name of Samode Haveli is located close to the Gangapole gate. This gate is situated on the north-east section of the walled city. Apart from the above 8 gates, another addition was made to the gates on the walled city called New Gate. The new gate is called so because this one was not in the original plan of Maharajah Sawai Jai Singh II. It was constructed around 1940’s and inspired by the famous Brandenburg Gate in Berlin. The design of this gate was toned down to align with the architecture of Jaipur. Prior to the one that we find now, earlier a very small gate used to exist in its place. This gate links Chaura Rasta Bazaar to MI Road and Ramniwas Garden and is on the Southern direction of the walled city. There is a popular belief that New gate was built by the last king of Jaipur Maharajah Man Singh II to allow faster access to his new residential building, Rambagh Palace from Jaipur City Palace. Feature – The design follows a large primary door in the center and smaller secondary doors on either side. This gate finds its inspiration from European architecture and blends it well with the local style and patterns. This is how these gates were placed on the city map. While all these gates are bound by a common design of floral motifs and color, each gate is unique in terms of architecture. With every passing day, old Havelis and buildings in the walled city are giving way to the new buildings and office complexes. These gates are great reminders of the rich architectural legacy of yesteryear. At the same time, all these gates are part of the history of Jaipur. Some write-up mention 7 gates of Jaipur which is incorrect. There were 8 city gates in old Jaipur as per the original plan and another one was added in the middle of the twentieth century. Another view of Chandpole Gate along with the Lord Hanuman temple located just adjacent to it. Thank you, Anubhuti. Have you visited Jaipur? I love visiting Jaipur for it’s sheer beauty. It’s been 3 years now that I haven’t been there. Your posts are really a good push to start planning. Such a beautiful description of the place which I call my sweet home. Thanks for the picturesque blog on the most beautiful city. But now I visit there only once a year in the summer vacation and ‘coz of your blog I can revisit it anytime. Thanks again for this blog. Pingback: Pol / Gates in Jaipur – Jaipur Thru My Lens !! Pingback: Jaipur Then & Now – Galta Gate – Jaipur Thru My Lens !! I have visited Jaipur a number of times and i have looked up at these majestic gates with awe. Your post is sure to make the reader visit Jaipur, if they haven’t. Amazing shots! Lovely post. Rajasthan is among the top priorities in my bucket list. Hope to visit soon! This is so beautiful to see! Is there a reason the Chandpol gate isnt as decorated as the others? This is my dream city, I’ve been to Jaipur with my parents but during childhood and we own beautiful artistic plates and cups. I never knew about these gates, super informative post. Good to read your in-depth blog about Jaipur history. Clearly shows your spirit for the history and Jaipur. Stunning photos of all the gates! I love the architectural details! You always tempt me to visit this Pink city. Love your posts, images and the blog overall. I can’t recall so you have to help me, have we exchanged comments before?